A visit to the playground is more than fun. It lets kids exercise their bodies, brains, and social skills. It also gives them a chance for unstructured, free play that's important for healthy development. Just check that the play equipment is safe and then watch the fun happen. Choose a playground with equipment that is geared toward your child's age, matched with their abilities, developmental level and size. For example, smaller swings intended for younger children can break if larger children use them. And smaller children using equipment designed for older children can have difficulty reaching and climbing. According to the U.S. Consumer Product Safety Commission (USPSC), emergency departments treat more than 200,000 children for playground-related injuries each year. Most playground injuries happen when a child falls from the equipment onto the ground. That's why the best way to prevent injuries is to make sure the surface underneath it can help absorb and soften the impact when children land on it. Kids love to climb. It helps build strength, coordination, and depth perception while letting them see their surroundings on a different level. Platforms higher than 30 inches above the ground intended for school-aged children should have guardrails or barriers to prevent falls. Vertical and horizontal spaces, like those between the ropes of cargo nets, should be less than 3½ inches wide or more than 9 inches wide. This is to keep a small child's head from getting trapped while preventing them from falling through easily. Stairs, steps and rungs, the horizontal supports used to climb a ladder, should be evenly spaced. Round rungs to be gripped by young hands should be about 1 to 1½ inches in diameter. Check for sharp points or edges. For wooden structures, check for nails or screws sticking out. Metal structures should not have rust or peeling paint, which could contain lead. Don't let your child wear or play with anything that could get caught on equipment and become a strangulation hazard. Avoid sweatshirts with drawstrings or necklaces, for example, and keep jump ropes and pet leashes away from equipment. If your child rides a bike or scooter to the playground, he should take off his helmet while playing. Straight, wavy or twisty, slides give kids a gentle, confidence-building thrill. Metal slides can get very hot from the sun and seriously burn a child's hands and legs. Plastic slides can get very hot, too. On hot, sunny days, look for playgrounds where slides are shaded. Slides should have a platform with rails at the top for children to hold. There should be a guardrail, hood, or other structure at the top so that the child must sit before going down the slide. Open slides should have sides at least 4 inches high. Make sure there are no rocks, glass, sticks, toys, debris, or other children at the base of a slide. These could get in the way of a child landing safely. The cleared area in front of the slide should extend a distance equal to the height of the slide platform. Teach your child to go down the slide feet first to avoid head injuries, and to make sure anyone in front of them is all the way down before they go. Don't go down the slide with children on your lap. While it might seem safe if you are holding them, research shows children's legs often get caught and injured on the way down. 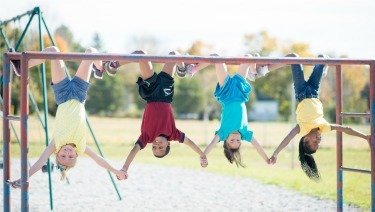 Swinging is shown to calm kids, build sensory skills, and even help them better cooperate with other children. Make sure the cleared distance in front of and behind a swing, and the shock-absorbing surface beneath it, is twice the height of the suspending bar. Walls, fences or other objects should be at least 6 feet away from either side of a swing. Make sure open or "S" hooks on swing chains are closed to form a figure 8. Swing sets should be securely and deeply anchored to prevent tipping. Discourage kids from swinging on their tummies or jumping off. Teach them not to run in front of swings while other children are using them. Even on the safe, age-appropriate playgrounds, adult guidance and supervision is the best way to prevent injuries. In fact, researchers say lack of supervision is linked with nearly half of playground-related injuries. So, as your child climbs, slides, swings and glides, keep an eye on the action and be ready to intervene if they are using the equipment inappropriately! Julie Gilchrist, MD, FAAP, is a pediatrician and researcher who serves on the American Academy of Pediatrics Council on Injury, Violence, and Poison Prevention. She studies how to prevent childhood injuries such as concussion, drowning, falls, poisoning and suffocation. Dr. Gilchrist spent 20 years at Center for Disease Control and Prevention Injury Center and now serves as a consultant.